Allstar’s fuel cards are now accepted at ITM’s national network of hydrogen refuelling stations. Marking the first fuel card provider to sign up to ITM’s network, the move provides Allstar customers with an integrated cashless payment solution capable of supporting mixed vehicle fleets. 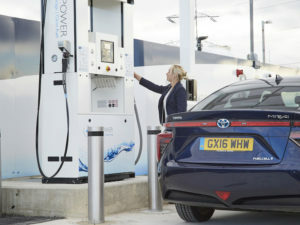 The partnership comes after ITM received a request from a large public-sector organisation who already used the fuel cards routinely and wanted to be able to use them to refuel its growing fleet of hydrogen vehicles. Although there are currently only two hydrogen fuel cell models available to buy in the UK – Hyundai’s ix35 fuel cell and the Toyota Mirai – Honda’s Clarity Fuel Cell arrives later in 2018. Hyundai’s Nexo, which replaces the ix35, also goes on sale in select global markets this year although it’s still not known when it will come to the UK. Meanwhile Kia has confirmed plans to offer 16 electrified vehicles by 2025, including an all-new hydrogen fuel-cell electric vehicle (FCEV) in 2020.